Just keeping the blog live... dont' really know why but I don't want to lose the last few years and might come back to it one day. In my most recent posts I had a little self-congratulate about how amazing I am at exercising. I felt as though I was there... fit. Ha ha ha ha ha! My body laughed at my cocksure arrogance. Thursday legs too sore to do much. Friday spin class & 4m walk, legs still sore. Saturday 16mile bike ride (I only got a bike a few weeks ago) + 2m walk. Amused myself by still being unable to fully extend right leg (quad wrecked) but cycling easily. 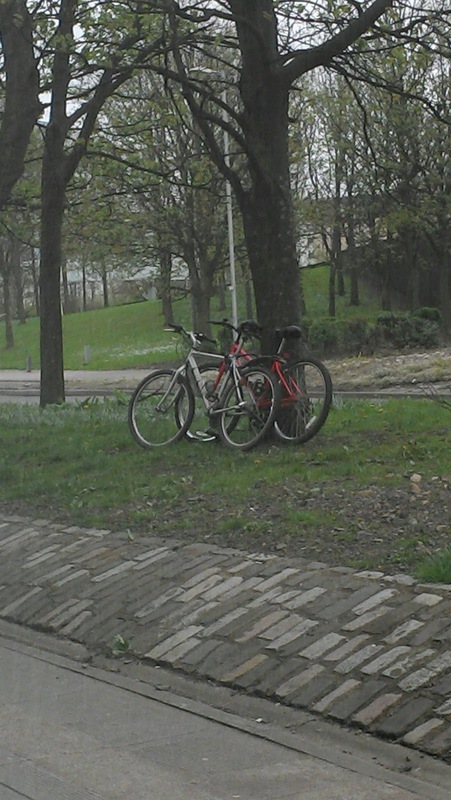 Monday spin class & 4m walk in the park in the rain.............. shoulders hurting. and my shoulders & back started to hurt more. And more. And more! I slept little since there was no way to get comfortable. OUCH! Tuesday - 9m walk over a hill (only 600+m) and along a canal path. Today - shoulders a bit better. Seriously though - OWWWWWWWW! I blame the bike ride. Maybe the spin. Probably the bike ride. 26 June I go to India with Girlguiding Glasgow to visit Sangam (world guiding centre). I feel all sorts of things about this - ranging from terrified to elated and excited. Mostly I'm excited... and the closer it comes the more excited I feel. I have 1 payment left to make - and then it's all go! 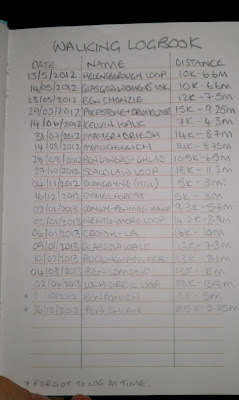 At New Year I started a challenge to walk 500 miles by the end of June. I then signed up for a trip to India leaving 26 June... shaving 4 days off my time. I therefore backdated the challenge to 26 December (handy as it was a day I did a lot of walking!) and have been working on it since. At first I had to walk 3.3m per day. It was hard to do - if you missed a day the total shifted so it was important to try to walk 3 miles every day. I was TIRED. I walk a lot - so thought this would be easier... somehow having to do it on days when you were busy doing other things made it really quite difficult. After a while it became easier. Then I had a few days where I couldn't go out - days where I was working away and simply didn't have the time after travelling to fit an hour or so walking into the day. Last month I was needing to walk over 5 miles per day to hit the target. I worked really hard to get some extra miles in and am currently back at just over 3 miles per day. 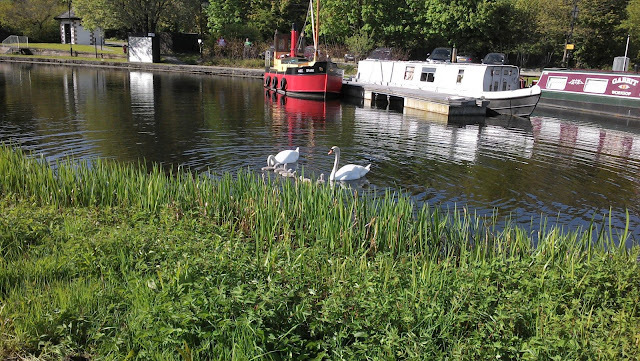 Well it has been a quiet day today so I went for a nice longish walk. I returned to teach but the boy ... just arrived!! It may appear to be spring but it isn't. 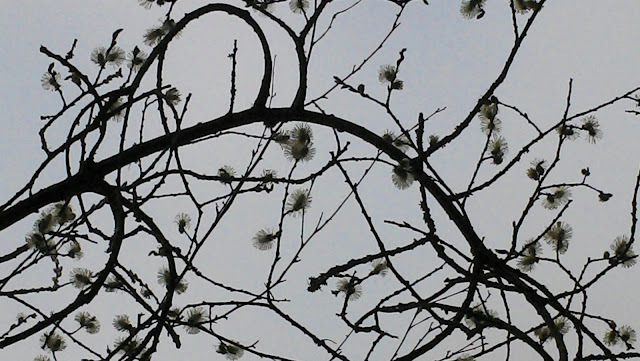 However the flowers and trees have finally started to grow so walking is ever more pleasurable. To hit my 500m target by 26 June I have to do 3.7m per day. Yesterday I did 2.5 round the park which was pleasant then 4m round Mugdock Country Park which was better as I had company and we saw deer and a buzzard. Brownies tonight was music and was quite fun. 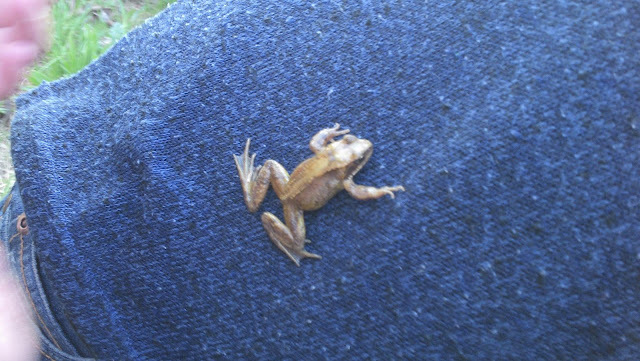 We also went outside and found frogs in the flowerbed! One jumped and landed on leader Amy's top. 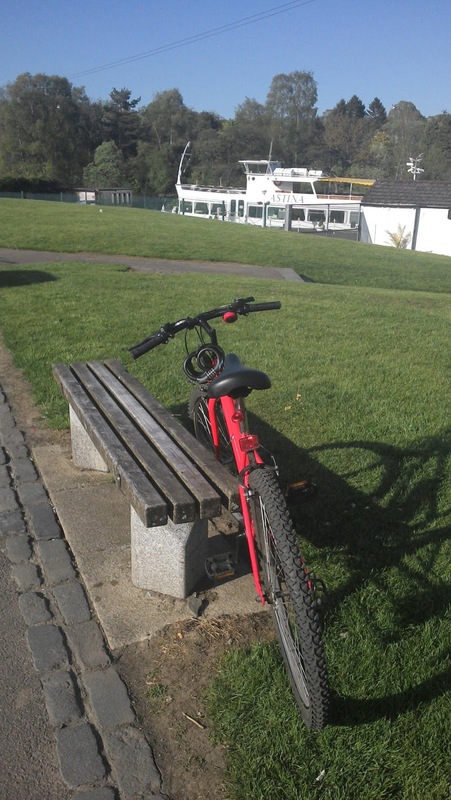 I rode my beautiful bike to and from Brownies AND from home to the pub. Yeah!! I have a bike. This is it!! (It found a friend). 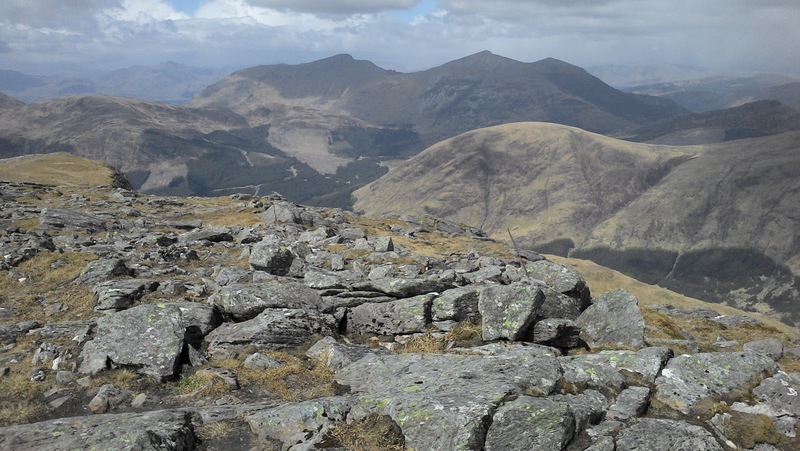 You can skip Level 1 if you have completed Silver or Gold Duke of Edinburgh awards. I have done this. For Level 2 & 3 - You need to go on first aid training that is HSE approved for 16+hrs. I checked costs online - this is an expensive undertaking... To be queried with relevant adviser at a later date. 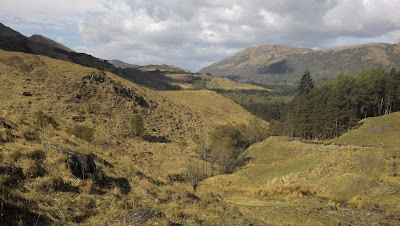 A log is required to record the required 20 minimum 10k or longer walks. At this point I decided with PJ's help that we would sort out our various logging methods into a book which I have been saving for a good use. It has a lovely painting of a loch by Brian Cook on the cover. 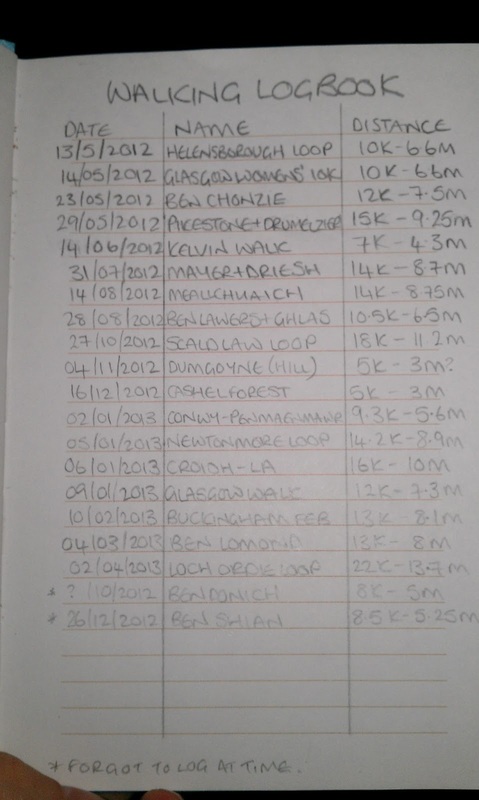 Having logged our memorable or significant walks since we started recording them (May 2012) I have found 14 so far are over 10k. You can use walks completed in the last 3 years. 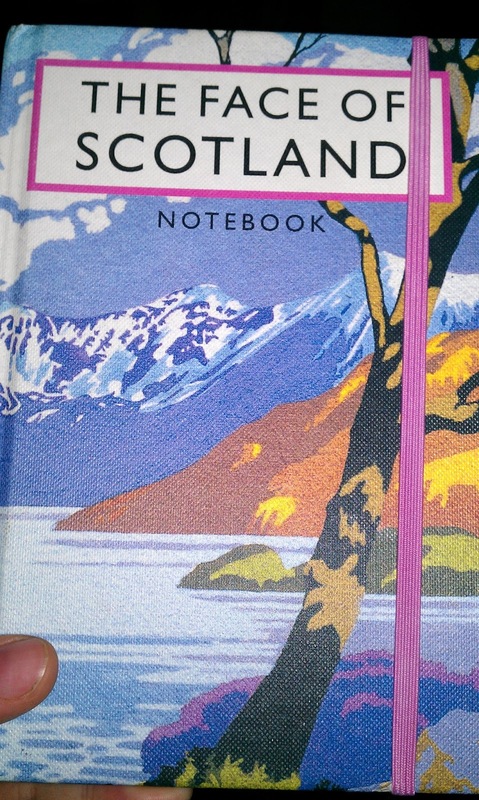 I will love looking back at this notebook in years to come, remembering the walks and the associated comments I have included (such as the pints in the thatched pub in Maids Moreton. This is a picture of icy Loch Ordie which we visited yesterday on a 13.5mile loop walk incorporating one terrifying snowy muddy steep but short hill. We just saw 18 nests in a single blackthorn hedge. Mistlethrush, blackbirds, robins, a chaffinch and a bluebird were watching us walk by; guarding the half-built nests. Buds on the bushes will hide them soon, so I took a picture from afar and tried not to upset the birds. Tomorrow night we are holding a tea party at Brownies. 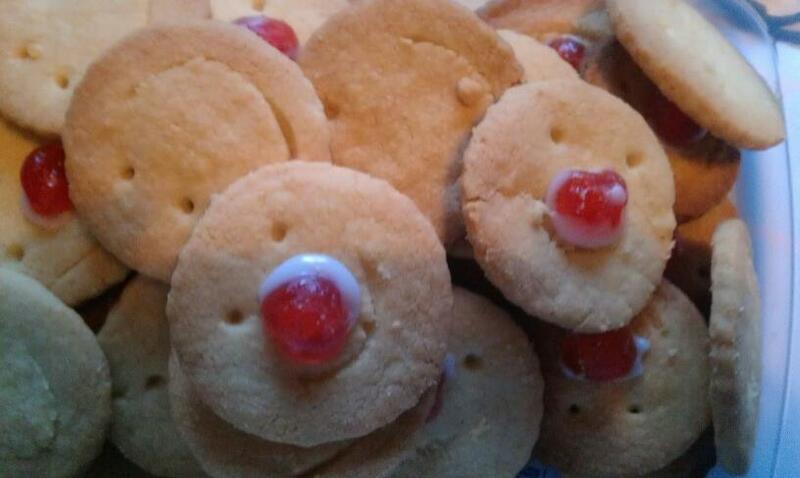 We are selling Red Nose cookies. We are singing La Cucaracha. I am getting a chance to chat to the parents for a bit. This weekend I was away having fun in Birmingham (and doing my OU Welsh!). 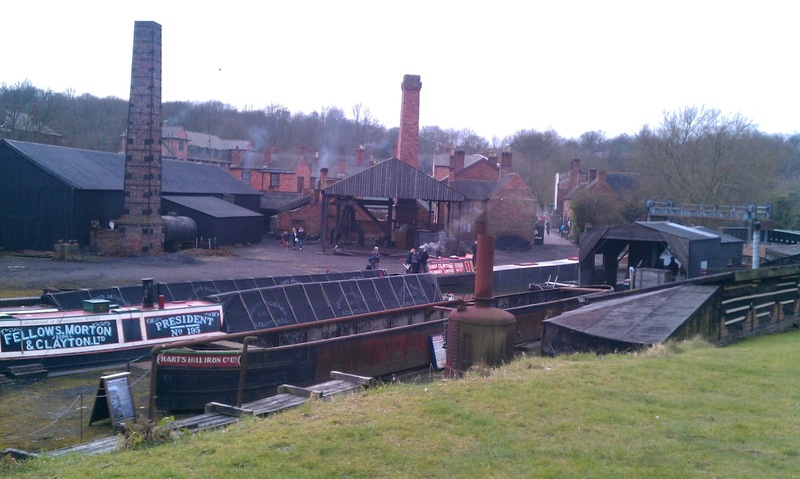 We went to the Black Country Museum. Fantastic! There are shops to go in where you can buy things made as they would have been made during the Industrial Revolution. There's a mine to go down, a boat to go on (costs extra - didn't do it), houses to see, demonstrations of people working doing things in the original ways - we saw someone making a chain link by link. 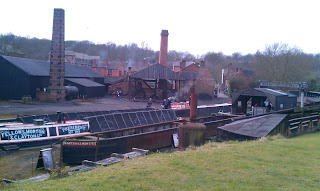 If you are ever in the Birmingham area - go to the Black Country Museum. Give yourself the whole day. Make sure you go to the houses at the top near the entrance - my best bit. 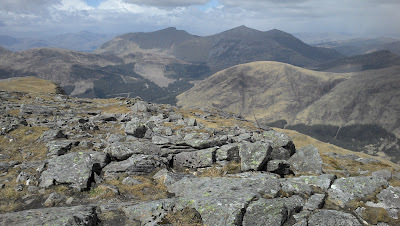 Climbed Ben Lomond (967m) from 10m above sea level. Hurt on the way down. Did it as fast as we could. 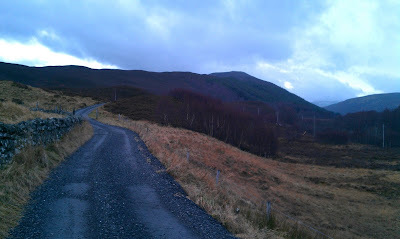 It was icy/snowy at the top - and very cold in the thick cloud. You can't see the top in my photo. Worked in Edinburgh - 7.15 departure from home... 6.30pm return. Finished the baking at home (using left-over dough). Wednesday: Up later (7.30ish but for no good reason). Worked in Edinburgh: 9.00am departure. NOTHING TO DO AT NIGHT (except practice... should also have done Welsh but didn't). Here is one of our two entries. The other was just a big bit of fabric with our unit number on it. Other news; I am in Birmingham (more accurately Halesowen) this weekend having travelled down for a Welsh lesson! Writing that down it seems a bit mad: travelling from Scotland to ENGLAND for a Welsh lesson. It was good, but I wrecked it a bit by being hungover (unfairly.... Had some wine on arrival with friend and family but not loads and not that late!). It is not an easy language to learn despite my many Welsh-speaking family members. I really like it though. There is a cockerel somewhere nearby! I am in a really built up part of Britain. Birmingham is huge and sprawling - there are houses as far as you can see in every direction. Halesowen is a separate town, but it joins up with Birmingham - or it appears to me that it does. So it seems strange to hear a cockerel (at 5am). I presume it is in someone's garden. My computer broke..... it's still broken. 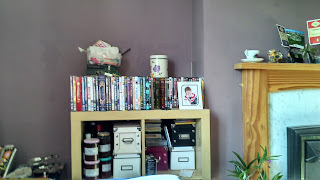 A whole shelf of DVDs fell on it. 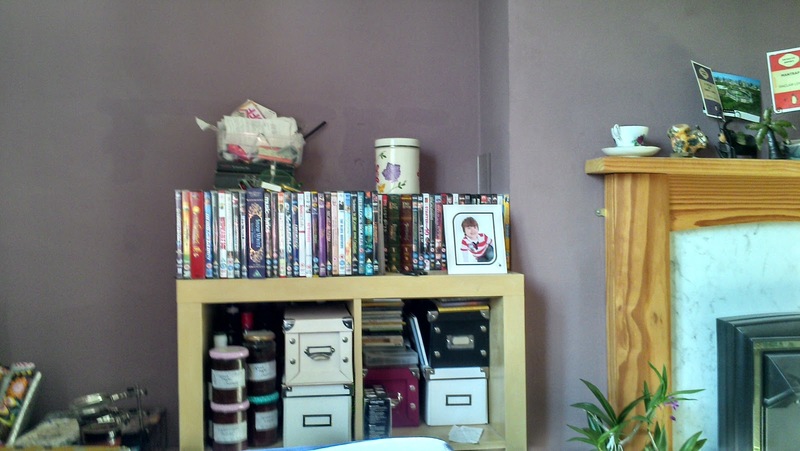 All of these DVDs... and the other stuff. I hope to get my new (insurance) computer TODAY! Lots to tell you when it arrives. January is traditionally my quiet month where I avoid my tax return yet worry about it constantly, submitting it as late as possible after a full month of grumpiness. You may be able to spot that I could do this a better way. In order to distract myself I also do as many other things as possible in spare time. I have done some Brownie planning, booking pack holiday and signing up for Helen Skelton's Red Nose Day Challenge. I have been to help prepare Thinking Day crafts for Glasgow County. I have signed up for a trip to Sangem in India (it's a Girlguiding trip) and have been to the first workshop. I have tried a new spin class that had an abs workout at the end. I couldn't laugh comfortably for 3 days! Most recently I tried a beginner yoga class. I do not think yoga is for me. The hands together or raised towards an imaginary sun felt odd - reverent but without an understanding of why, or what for. The movements were good - hard for me to do, but repetitive so I could learn them at my very slow pace. The bit I found hardest were the meditations... I'm not very keen on sitting quietly, so lying quietly with my eyes shut folllowing instructions was hard. I didn't like it. However I don't think it would be right to make a decision on a single session so am going again next week. We won a pub quiz. I went to watch Glasgow Warriors in the Heineken Cup against Northampton Saints. Loved it. I have visited friends, and was given Herman the German friendship cake which I have been looking after for 3/4 days. This morning I fed him. Fyi the tax is done... But not actually submitted. It is due 31 Jan. It IS achievable... I think. I have another 6 stone to lose to get to 'healthy weight'. The fact that 'healthy weight' is lighter than I was at 14/15ish when we had to weigh ourselves at school (sure I was about 10stone) is immaterial. In an attempt to reach this goal, I have set a short-term goal of walking 500 miles by my birthday (June). I realised that it actually needs to be done by 26 June as I'm off to India, so have decided to count miles walked from Christmas day to the 25 June. I have walked 54 miles since Christmas. It had sounded feasible when I made up the challenge... I walk about 6 miles a week to and from work. It's 3 miles to the gym and back and I do that at least once a week. This leaves 83.33 miles per month, which is 21 miles a week. I usually walk 9 miles a week and I thought that more than doubling that would be EASY? My legs hurt. I don't know if I can do it!